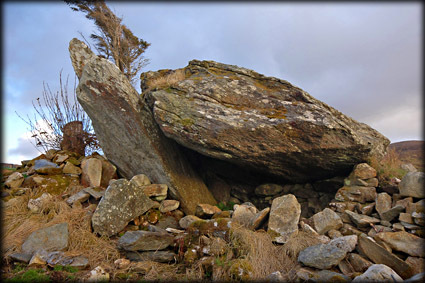 I came across this particular portal tomb whilst looking for the line of 6 portal tombs also at Malin More. I had always presumed that this was the location for those tombs, but in fact this is the location of just two portal tombs and a couple of standing stones. A large almost 4 metre long roofstone lies nestled against the single remaining portal stone. Another collapsed stone lying against the east facing portal stone may be the doorstone. The tomb now appears to be part of an old field wall. 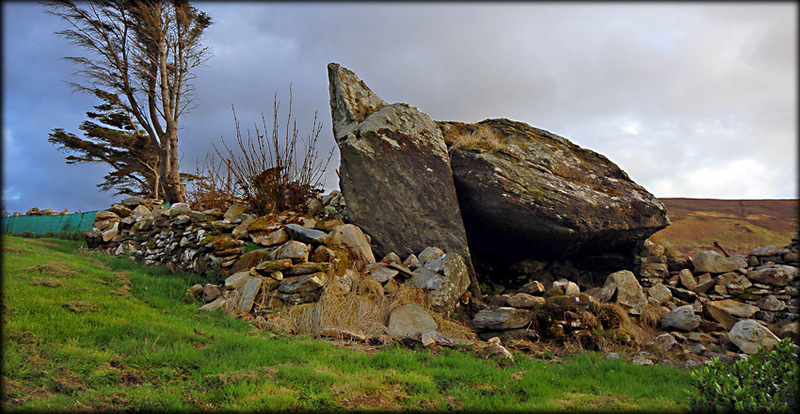 Situated quite close to Cloghanmore court tomb, this tomb is well worth a visit. Situated: From Glencolumbkille take the R263 west towards Malin More. After 3 kilometres turn left at the Malin More crossroads. Drive for two kilometres till you come to a line of houses set back from the road. Up the second driveway to a single storey cottage, stands this collapsed portal tomb. Discovery Map 10: G 5164 8310. Last visit April 2010.